1955 Henderson City High School Football Team. #1 Ranked football team in Kentucky. Only Barret High, 1916 stood as the only undefeated Henderson team in the school history for 47 years (Barret opened in 1908). Henderson City went on to win the mythical state football championship (there was no playoff system until 1959). The City High Flash repeated another undefeated season four years later, with a 12-0 record in 1959, again winning the state championship by defeating Ft. Thomas Highlands. This was the first year for the new Henderson City High School Flash. This was the 3rd season for Coach Don Shelton and head assistant Coach Don Chapman, as he took a ragged team from the old Barret Manual Training High School to a new era. His first two seasons he managed to win a total of but 8 games, and was able to turn the program around in 3 years. The Barret Manual High School Purple Flash had been the cellar dwellers of the Western Kentucky Conference for the last few years. Now, with a team full of talent from top to bottom, City High had no weaknesses. With all-state performers Quarterback Ronnie Sheffer, Lineman Pascal Benson, and fullback Sonny Watkins, they managed to go through a perfect season. They also had superb running backs in future all-state performer junior Petie Bryant and senior Sammy Joe Shelton. Sammy was later a punter & running back for SMU., while Petie became a star running back at University of Louisville. They beat three teams by a point in each game and cruised past their WKC foes in fashion. The Flash easily handled both opponents from neighboring Owensboro. The games against Daviess County Panthers & Owensboro Senior Red Devils set the stages for the Litkenhaus #1 ranking in the final polls for the season. The other big rivalry were the Madisonville Maroons, which the Flash handled easily 25-7. The Sturgis Bears stingy defense held the Flash to their season low of 7 points. In the Litkenhaus state ranking in the Louisville Courier-Journal the City High Flash was ranked #1, with the undefeated Prestonburg Blackcats (10-0) ranked # 2 in the Litkenhaus polls. Both teams claimed the state title. 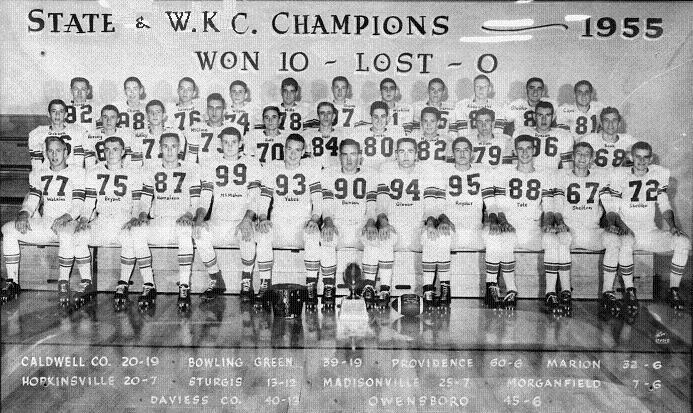 The KHSAA did not utilize a state playoff system until the 1959 football season. Because of the #1 ranking in the Litkenhaus polls, the Henderson City School Flash claimed the state championship title outright. Prestonburg also claimed title, but they still were only ranked #2.